Mushroom and Spinach Risotto is hearty, cold weather comfort food at its best. Creamy risotto rice, mixed with convenient and flavour packed dried mushrooms, iron rich spinach and topped with some parmesan and parsley. An easy weeknight meal, but special enough for date night too. When it comes to risotto, you can’t go wrong with mushroom – it’s a classic. 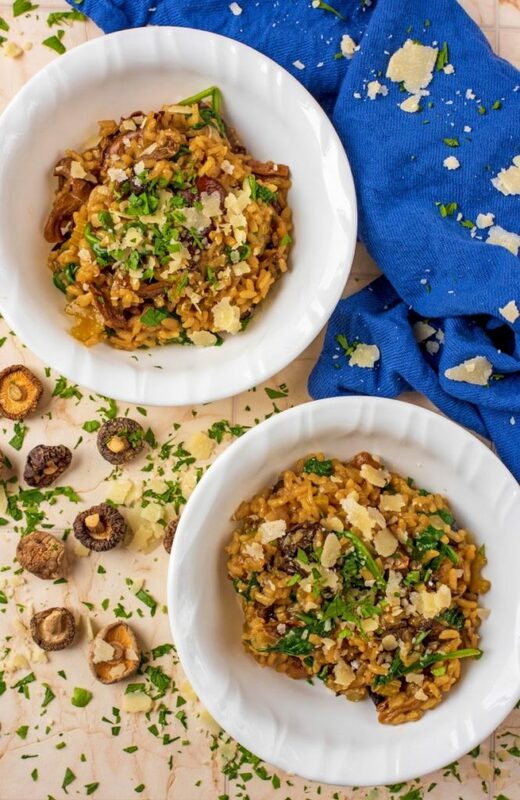 Mushrooms have a really meaty texture whilst still keeping this risotto vegetarian and the option to be vegan. 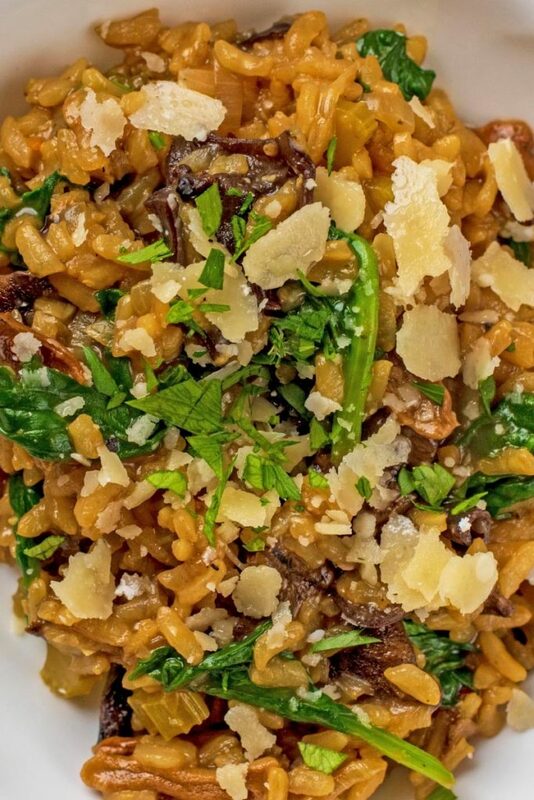 We have given a mushroom risotto a vitamin boost by adding iron rich spinach. Not only does adding spinach give it an iron boost, but it adds lots of colour to a fairly bland looking dish. But don’t worry, this dish tastes far from bland! You could swap the spinach for other greens like kale, chard, cabbage or pak choi. A good opportunity to use up some leftover greens. As the mushrooms are the star of this risotto, we wanted to use a a selection of different mushrooms as they all have such a unique taste and texture. You could just use standard white mushrooms, but why would you when there is such an amazing selection of mushrooms out there? We went with Shiitake, Forest mushrooms and Porcini and used dried mushrooms because they are so handy to keep in the cupboard and just need to be rehydrated. It saves us having to worry about having fresh mushrooms that might have gone past their best, and speciality mushrooms can be hard to find sometimes. 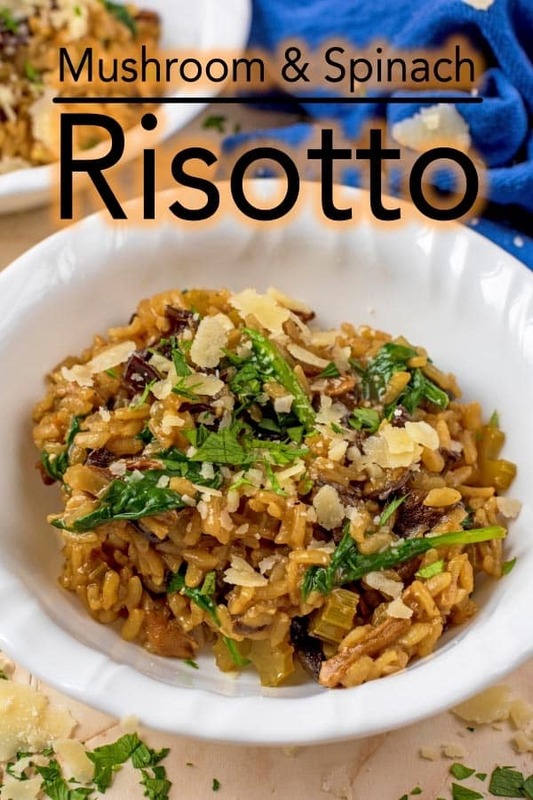 Risotto is a really hearty, heavy and comforting dish but that doesn’t mean it has to be unhealthy. We have added plenty of vegetables to ours and left out the cream and just used a little cheese – but you could leave that out. You could swap the risotto rice for brown rice or even quinoa but the cook time and texture would of course be different. One: Add the olive oil to a large pan and then add the shallots, celery and garlic and gently cook for 3 minutes. Two: Add the rice, salt and pepper, stir and cook for 1 minute. Three: Drain the mushrooms and add to the pan with a ladle of the stock. Keep adding a ladle of stock at a time and waiting until the rice has absorbed the stock before adding another until you have used all the stock. This should take around 20-25 minutes. Five: Stir the spinach and lemon juice in and serve with fresh parsley and parmesan on top. 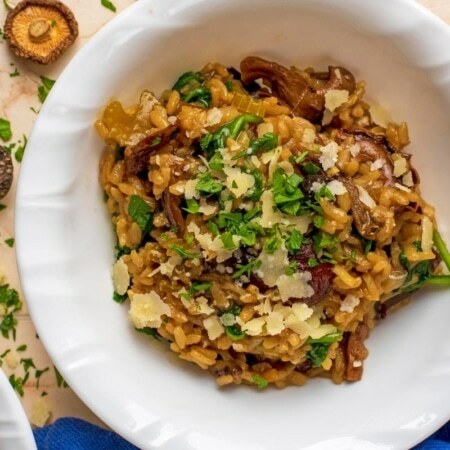 Keep this mushroom risotto vegan by skipping the parmesan. You could also stir through some oat creme fraiche to add a bit of creaminess. This is a good way to use up leftover cheese and herbs, so feel free to mix them up. Goats cheese and chives also goes well in this recipe. 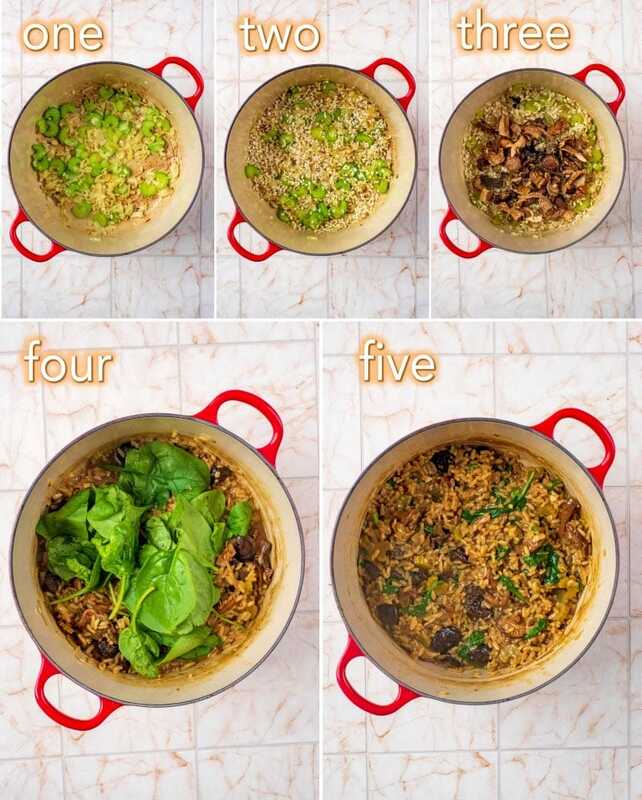 Swap the risotto rice for brown rice or quinoa, but be mindful that the cooking times would vary. Add some extra flavour by stirring in some chopped sun dried tomatoes before serving. Do you want to be kept up to date on more delicious posts like this Mushroom and Spinach Risotto? Please subscribe to the blog mailing list (it takes 30 seconds). 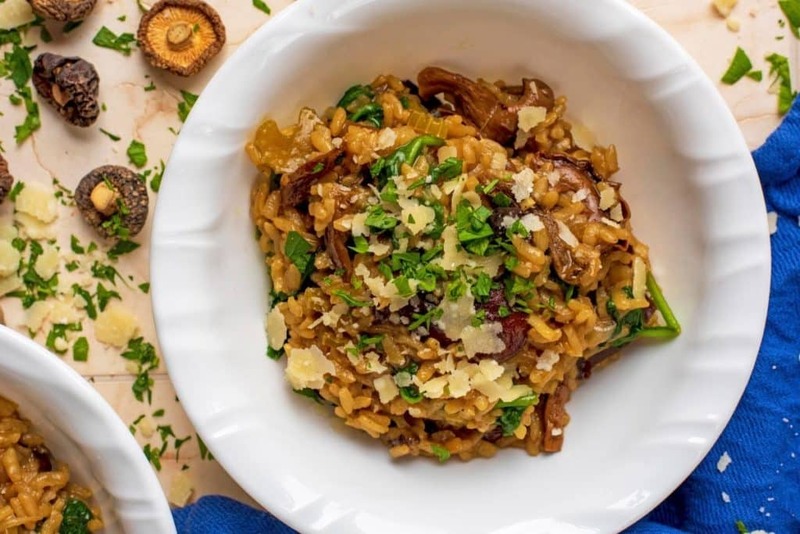 If you’ve tried this Mushroom and Spinach Risotto, or any other recipe on the blog, then let us know how you got on in the comments below, we love hearing from you! You can also FOLLOW US on FACEBOOK, TWITTER, INSTAGRAM and PINTEREST to see more delicious recipe ideas, behind the scenes shots and also what we are getting up to. Mushroom and Spinach Risotto is hearty cold weather comfort food at its best. An easy weeknight meal, but special enough for date night too. Add the olive oil to a large pan and then add the shallots, celery and garlic and gently cook for 3 minutes. Add the rice, salt and pepper, stir and cook for 1 minute. Drain the mushrooms and add to the pan with a ladle of the stock. Keep adding a ladle of stock at a time and waiting until the rice has absorbed the stock before adding another until you have used all the stock. This should take around 20-25 minutes. Stir the spinach and lemon juice in and serve with fresh parsley and parmesan on top. I really need to cook risotto more. It’s so easy and so many different flavour combinations too. Love this mushroom version. I don’t often have risotto for dinner but I do enjoy it so should have it more often. This looks absolutely delicious. As of this writing, I was thinking about my dinner later – and this gave me an idea! Now I’m craving for mushrooms and risotto 😀 hahaha thank you dear! Risotto is my comfort food! This sounds so good! Oooh I adore risotto! I haven’t made it in awhile but definitely need to put it on my must-make dinner list. Also, I’m about to make an Asian brown rice dish for dinner! I love the look of this recipe! Can’t wait to try it. I’ve just come across your website today and it seems you’ve had an incredible journey so far. 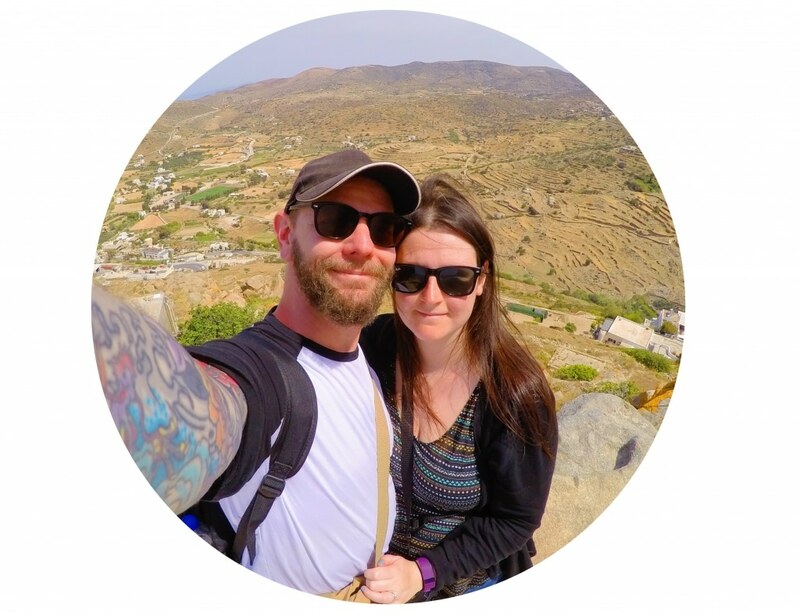 I’m new to blogging and have just uploaded my first post (my strange rambling thoughts) any feedback or tips would be great (from anyone who might be reading this too). Anyway, I seriously can’t wait to try this out! I adore spinach and mushrooms so this is perfect!! This sounds incredible. My grandma makes this amazing risotto, but it doesn’t have any veggies! I think mushrooms and spinach are both underrated. Yum! Risotto is so warming too! I haven’t had a risotto in so long. My favourite was a seafood risotto, which I loved. This looks great!